Garmin X40 in a black and grey colour scheme. The ultimate sports band - With fitness tracking and golf gps functions. Packed with features, check the full item description for more details. Garmin X40 in a Frost Blue and Midnight colour scheme (basically light blue and navy). Garmin have been making fantastic fitness tracking bands for some time, this band has all those functions plus a golf gps with 40,000 pre-loaded courses. See full description for complete list of features. Garmin X40 in a Limelight Lime Green and Midnight Navy colour scheme. Fantastic golf gps band packed with functions, as well as being a great fitness tracker too. See full description for more details. Garmin X40 in a White and Black colour scheme. Amazing watch that is packed with features, see the full description for more details but in a nutshell it is the ultimate fitness tracking and golf gps accessory! New for 2019. TaylorMade FlexTech lite stand bag in Black/Red. 5 way top and weighing only 4.1 lbs which is slightly lighter than the standard FlexTech. Full length club dividers and 8 pockets. New for 2019. TaylorMade FlexTech lite stand bag in Navy/White. 5 way top and weighing only 4.1 lbs which is slightly lighter than the standard FlexTech. Full length club dividers and 8 pockets. New for 2019. 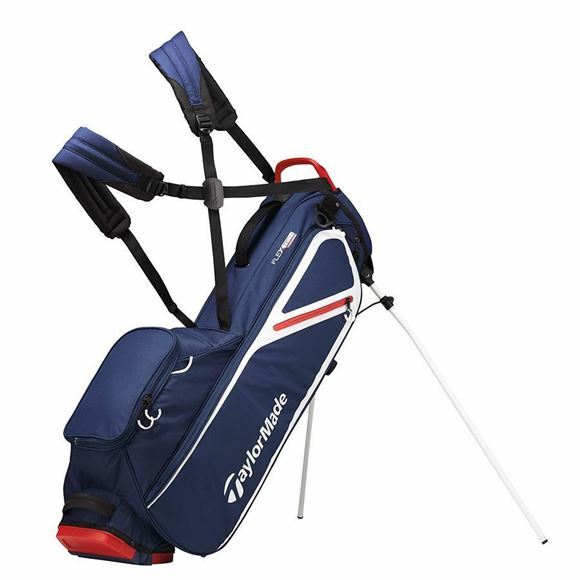 TaylorMade FlexTech lite stand bag in Red/Black. 5 way top and weighing only 4.1 lbs which is slightly lighter than the standard FlexTech. Full length club dividers and 8 pockets. We use DPD Local as a courier - They are fantastic and offer some great services. We aim to get every parcel out on a next business day delivery. Your parcel will arrive hassle free, quickly and with regular updates. They make it very easy to make special arrangements, read their info below to see why DPD Local are probably the best courier in England. It's always been more difficult to deliver to home addresses than business premises. That's why we've developed a unique interactive service that advises your customers when their packages will arrive with a one hour delivery window, along with the ability to track their delivery on a real-time map. DPD Local's industry leading innovations give customers an unrivalled parcel delivery experience. Thanks to Predict, customers receive a one hour delivery window, plus a host of rescheduling options both the night before and on the day of delivery. What's more, Follow My Parcel enables customers to watch the progress of their delivery on a real-time map, with a 15 minute time slot also provided. With DPD Pickup, customers can choose, at the point of sale, to have their order delivered to the nearest DPD Pickup point. Or if they are not going to be at home for a delivery, an 'in-flight' option is now available through the text and email notifications, by which the delivery can be diverted to a local DPD Pickup point. Customers can also manage any returns via their local DPD Pickup point. We continue to innovate, and with many online shoppers used to click-and-collect as a delivery option, DPD Pickup gives retailers another great option for their customers. NEXT WORKING DAY DELIVERY only available if ordered before 1pm. Congratulations to Tiger Woods on winning The Masters 2019 - With his TaylorMade M5 Driver! Shop with us and enjoy the best selection and service available online! Browse our massive selection of products online. FREE next business day UK delivery on orders over £50. FREE European delivery on orders over £150. Copyright © 2019 Tony Valentine Golf. All rights reserved. We have PGA Pro's on hand to give expert advice. Please fill out the following details and we will call you back asap!